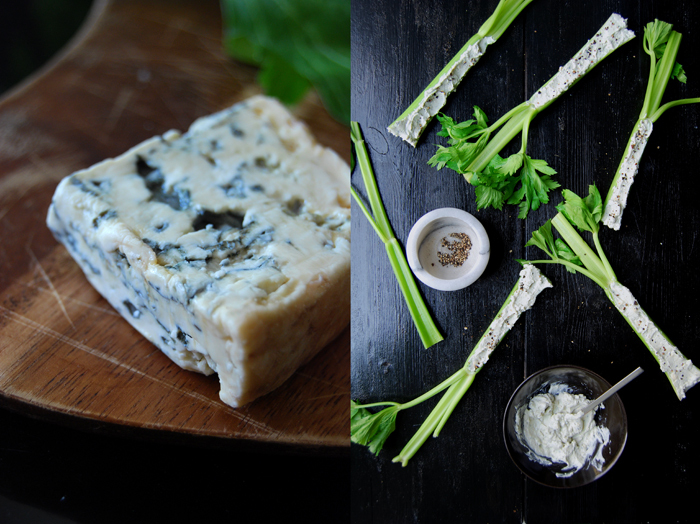 Crisp celery, aromatic blue cheese, cream cheese and crushed black peppercorns, that’s all you need for this little antipasto snack! I used Fourme d’Ambert, one of the oldest French cheeses from the Auvergne region. It has a strong taste and a creamy texture which blends perfectly into the creamy dip for the stuffing. 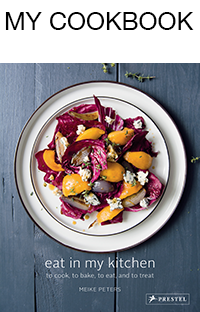 Sometimes I replace it with Stilton, its rich aroma goes very well with this recipe. Although my chosen vegetable, crunchy fresh celery stalks also have a strong and unique taste, I didn’t want the cheese to be too overpowering so I mixed it with some mild and milky cream cheese. You could also use Gorgonzola but in that case I would mix it with mascarpone instead of cream cheese, it’s a great combination, also on bread! The roughly crushed pepper adds some spiciness which makes the snack complete. 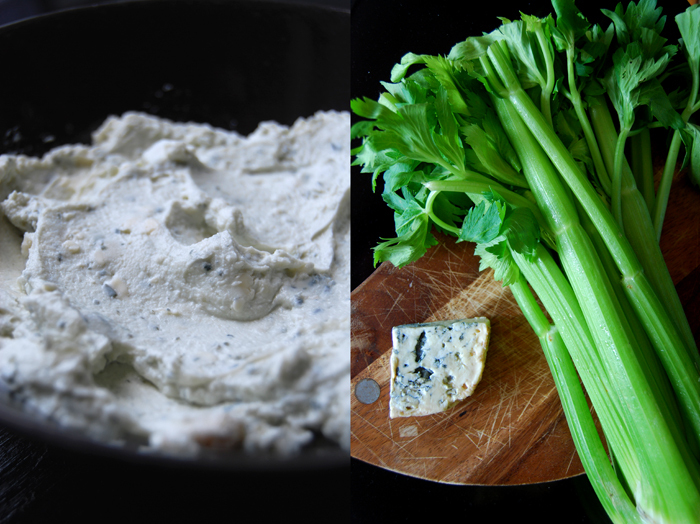 For 8 stuffed celery stalks, I mixed 50g / 2 ounces of Fourme d’Ambert with 1o0g / 3.5 ounces of cream cheese (depending on the blue cheese you might need some more or less) and spread it into the thick parts of the vegetable. I ground some black peppercorns roughly in a mortar to finish it off! 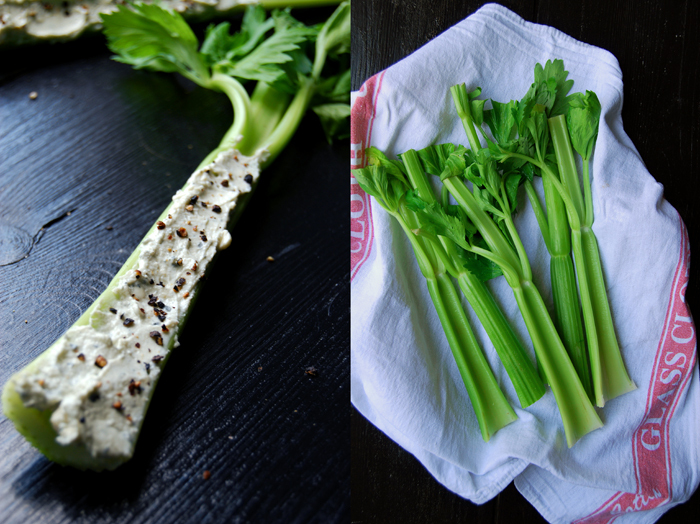 your celery stalk image… very top… on the right… me = speechless. love love love. 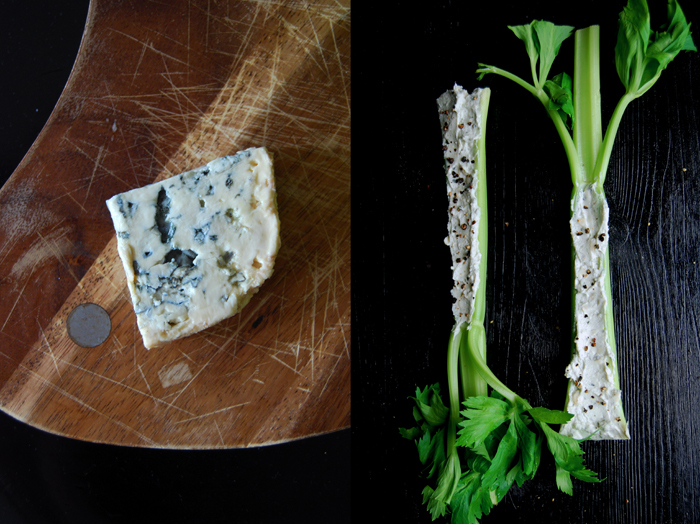 Yummy…blue cheese is something I always have in the fridge. 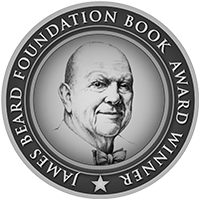 My favorite is Colston Bassett, but if I can’t get that it is usually Gorgonzola. That celery is such a gorgeous shade of green!